Following a dreadful 2012, the Boston Red Sox came together in a big way in 2013, finishing the regular season as the top team in the American League. Some are crediting the team's stylish facial hair for at least part of that success. And even if personal grooming habits haven't been the big reason behind Boston's success, it has made them more recognizable. With that in mind, OYO Sportstoys has released a set of 12 special edition Red Sox #getbeard minifigures. The small toys, which are fully compatible with traditional LEGO sets, are variants of the more common OYO Red Sox minifigures. Like the regular line of OYO MLB minifigures, each comes with a glove, bat, ball, cap and numbered stand. Players are in their white home jerseys. 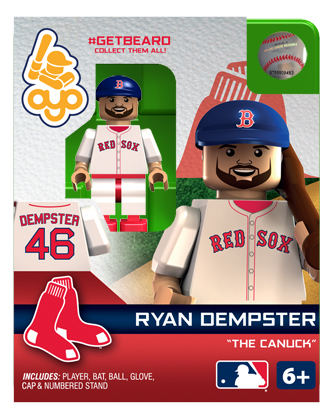 The limited edition toys come with different packaging that notes they're a #getbeard variation at the top. Under the player's name is the type of facial hair they happen to be sporting. Unlike regular OYO minifigures, these have just one run at the factory. Below is a full checklist of the figures and their beard monikers as well as a gallery of all 12 minifigures. NEW Dustin Pedroia OYO Boston Red Sox Mini Figure #GetBeard HTF limited edition!